The Winnipeg Jets took another loss on the chin on Monday night, dropping a game to the Edmonton Oilers by a final score of 3-1. It wasn’t for lack of trying. Edmonton goalie Cam Talbot was superb in the victory for his club, turning aside 44 of Winnipeg’s 45 shots. Without question, the loss showed the Jets playing an up-tempo game that just didn’t pan out. They rolled four lines, got some quality energy shifts, kept the pressure on. Dustin Byfuglien had 10 shots on goal and collected nearly 27 minutes of ice time, while Bryan Little had seven shots of his own and picked up Winnipeg’s only goal. But while the Vancouver Canucks find themselves in a playoff spot in their Pacific Division, the Winnipeg Jets are on the outside looking in. The Canucks currently have 33 points, while the Jets have 32. The surging Central Division has proven tough, with the Dallas Stars, Chicago Blackhawks and St. Louis Blues all but out of reach. Of course, the Jets haven’t done themselves many favours. They’ve been poor on the road, with a 6-11-1 record outside of the MTS Centre. Predictably, they do alright at home. And while they’ve scored more goals than every team in the Pacific Division with the exception of the Oilers, they’ve allowed 100 goals against. The likes of Little, Blake Wheeler, Mathieu Perreault, and Mark Scheifele have done well offensively. Wheeler leads the way with 34 points in 33 games, while Little has a team-leading 13 goals. The offence has worked at its best when it gets going early, like it did when the Jets took on the New York Rangers on Friday night. That 5-2 win was an example of what Winnipeg can do. Unfortunately, Winnipeg can also lose in bunches. One has to wonder if Kevin Cheveldayoff’s off-season plan of watching players like Michael Frolik and Lee Stempniak depart can actually pay dividends. After all, the Jets find themselves in the basement when it comes to payroll and are among the league’s most frugal teams. It’s tempting to suggest that this has played a role, with Winnipeg lacking overall roster depth because Cheveldayoff refused to spend. But things are usually more complicated than that, aren’t they? As expected, the Jets haven’t exactly received good goaltending. Ondrej Pavelec has a .906 save percentage with a 2.82 goals against average, while backups Michael Hutchinson and Connor Hellebuyck have done well enough trying to fill in the gap. 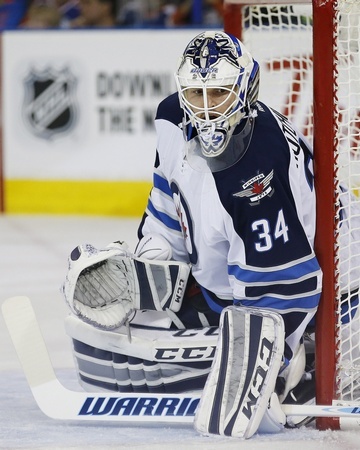 In effect, the Jets are playing a style that will often leave their netminder hanging. They’re a rushing team and they’re a big team, but their opponents have been able to find openings and steal wins. Winnipeg may have pulled out of their “happy to be here” naïveté with a desire to be taken seriously, but now they have to prove they belong at the dance.